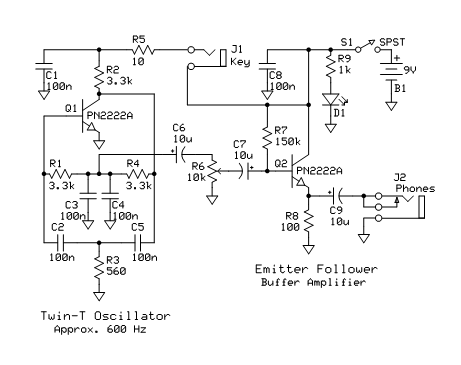 Here’s quick update to post the schematic of the code practice oscillator that I mentioned previously. As you can see, I just paired a twin-T sine wave oscillator with a buffer amp that feeds directly into headphones. The twin-T provides plenty of voltage, so the buffer is all we need to provide enough current to drive headphones. You can also download a PDF file of the schematic here. Thanks to a suggestion from David KB0ZKE, I’ve decided to rework the layout to fit in an Altoids tin (an excellent idea!). I’m also going to try to come up with an easily reproduced straight key made from a paper clip, knob, wooden base, and wood screws. This idea was inspired by KE6GS, who has a great example of such a key right here next to his Willamette. I’ll try to get the layout changes finished real soon. The detailed documentation will have to wait until after I finish the Willamette documentation (but I have started on it again, so it will come in the near future).